But I'm very curious to your religious affiliation, your name is Arabic so I'm presuming you're Islamist...of course I could be wrong. I'm glad you've found this blog and are interested in this subject matter. Yes, you're correct -- I have a Muslim name because I'm Pakistani. I wasn't aware that Ethiopian / Eritrean Muslims rejected Ge'ez. As you may already know, Islam's birthplace (western Arabia) was squarely within the cultural, linguistic and religious sphere of influence of Ethiopia (i.e. Habesha) in the 6th-7th century. The Qur'anic text itself is replete with Ge'ez terminology, which is explained when we look at the earliest Muslim historical writings that report a very large presence of Ethiopians among the nascent community in Mecca and Medina. This even include the prophet Muhammad's surrogate mother, Umm Ayman, and one of his key companions, Bilal. Ethiopia (or rather "Abyssinia") thus plays a central role in the formation of the early Muslim community and it continues to be a crucial part of how modern Muslims imagine their community's distant past. Hmm, I'm not aware of any myself but I can ask some of my colleagues and let you know if they know of any. I'm sure youtube has snippets of Syriac (probably listed as "Chaldean") and Ge'ez liturgy, which includes biblical passages. In line 7 of the picture, I can’t read እአብሔ ; am I wrong ? Oh! 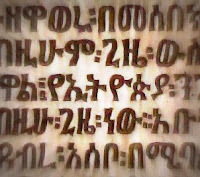 Thank you for pointing that out Richard -- I left a blank in my transliteration of "እ(ግዚ)አብሔር" since I wanted to write out the ligature of gaml and zay (as in the manuscript) but couldn't figure out how to type it. I can't find it anywhere (in unicode) online either, so I've just gone ahead now and put in the two letters separately. It could be transliterated either way -- with or without a glottal stop (ʾ). So far, I've been only noting the glottal stop (ʾ) if an ʾalf appears in the middle of a word (much like the normative transliteration of Arabic). A ligature ? that’s why it was impossible for me to find this “letter” !… You’re the best !